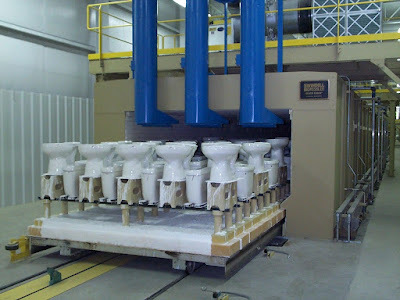 The forming and firing processes employed in the manufacture of whiteware products are outlined in this article. 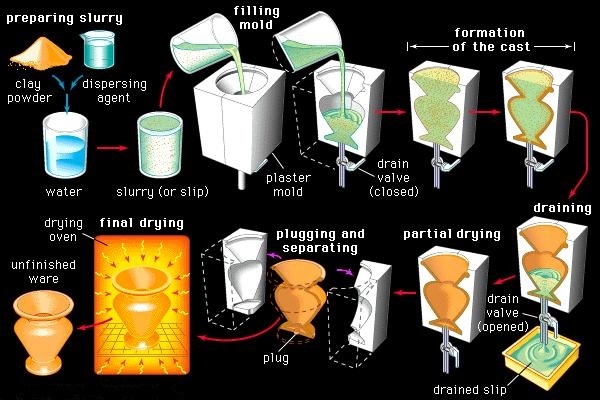 Typically, pressing is employed in the forming of tiles, chemical ware, and technical porcelains; extrusion in the forming of tiles and sanitary ware (including pipe), and slip casting in the forming of plumbing fixtures and some tableware. 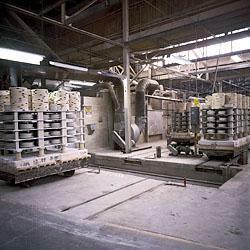 In addition to these standard processes, jiggering is employed in the manufacture of tableware. Jiggering involves the mixing of a plastic mass and turning it on a wheel beneath a template to a specified size and shape. Most whitewares are fired in continous tunnel kilns. The porous varients are fired at lower temperatures (1,100-1,250°C, or approximately 2,000-2,300°F), whereas china and true porcelains are fired at 1,250 to 1,300°C. 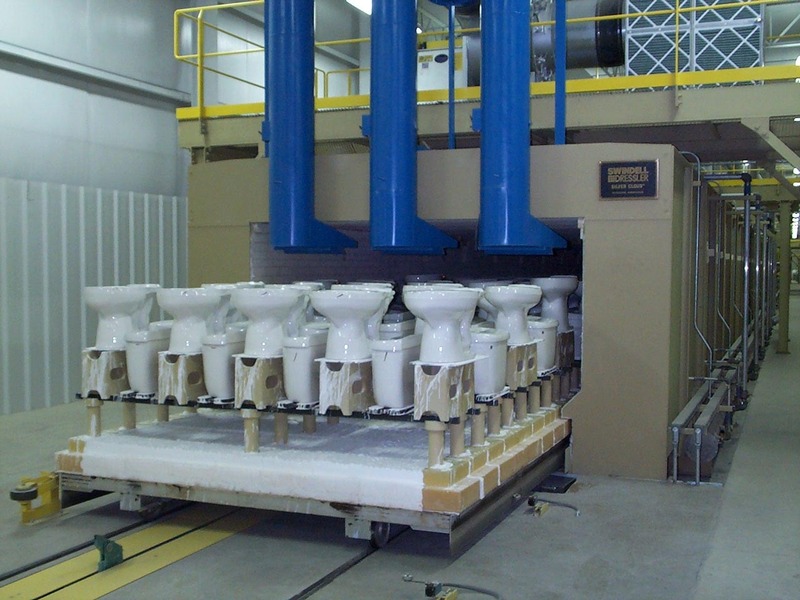 Porous and semivitreous whitewares may be glazed in a second firing to produce an impermeable glass coating for decorative or functional purposes. One of the great advantages of the triaxial composition of whitewares is that it makes the formed piece relatively insensitive to minor changes in composition of temperatures over which the three ingredients melt to form glass. As an example, in a typical feldspar-clay-silica composition for porcelain, a whiteware with a particularly high glassy component, small grains of fieldspar would begin to form liquid at temperatures as low as 990°C, and large feldspar grains would be molten by 1,114°C. Because of the high viscosity of the liquid formed, there would be no change in the shape of the ceramic piece until approximately 1,200°C. Above this temperature the feldspar grains would react with surrounding clay particles to form glass and "needles" of mullite (a crystalline aluminosilicate mineral formed during the firing of clay-silica mixtures) would grow into the liquid regions. In addition, the surfaces of silica particles would begin to dissolve and form solution rims, or envelops of glass surrounding the crystalline particle. As more and more of the silica particles dissolved, the resulting glass would become increasingly viscous, helping to maintain the integrity of the piece.